For the first time ever, we are endorsing political candidates who prove they support keeping education public. Answers to a survey that explored connections to public schools and views about school privatization, high-stakes testing, and the teacher shortage. The endorsed state candidates also participated in a September 12, 2018, forum organized by ICPE–Monroe County. Each one of the candidates we are endorsing understands that public schools are essential to our democracy. They value teachers and want all schools that receive public money to be transparent and accountable. They understand that our schools need resources and support, not punitive grades based on high-stakes tests. Voters who care about their local public schools should keep candidates’ public education stances in mind when they enter the voting booth. 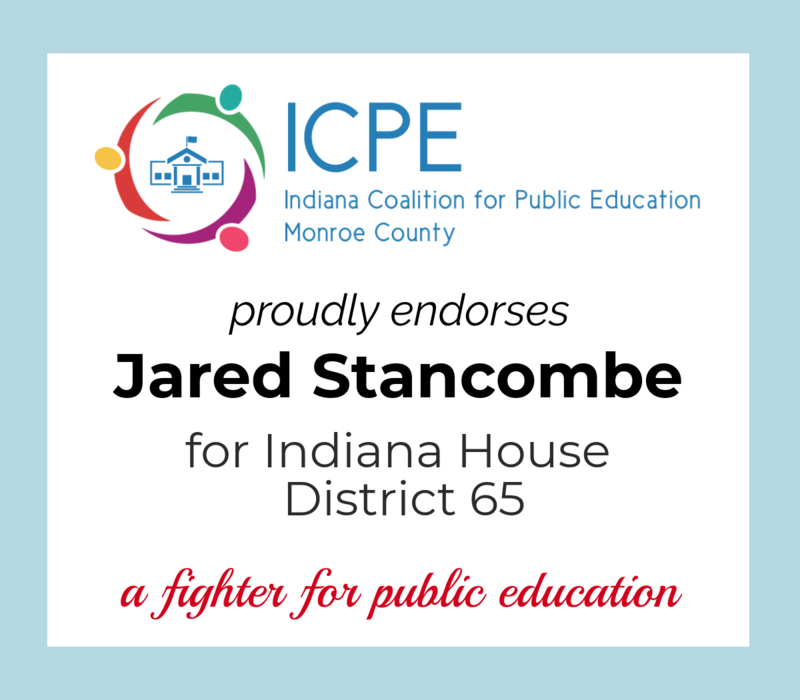 Bloomington, Indiana—Today the Indiana Coalition for Public Education of Monroe County—a nonprofit, nonpartisan advocacy group of parents, grandparents, educators, and other supporters of public schools—announced endorsements in the state and federal legislative races that will appear on the ballots of voters in Monroe County. 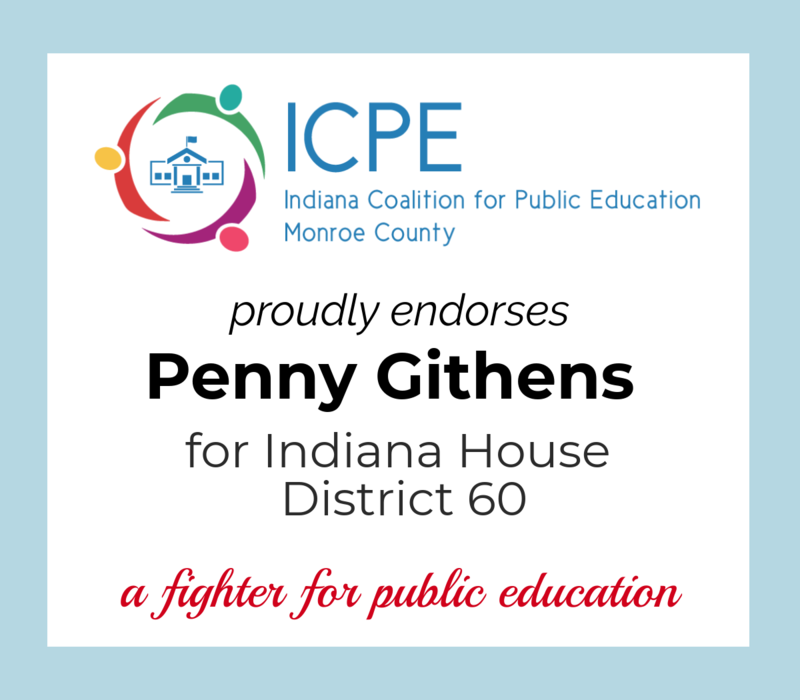 Pro-public education candidates chosen by the coalition include Penny Githens (House District 60), Matt Pierce (61), Amy Swain (62), Jared Stancombe (65) and E. Thomasina Marsili (46). 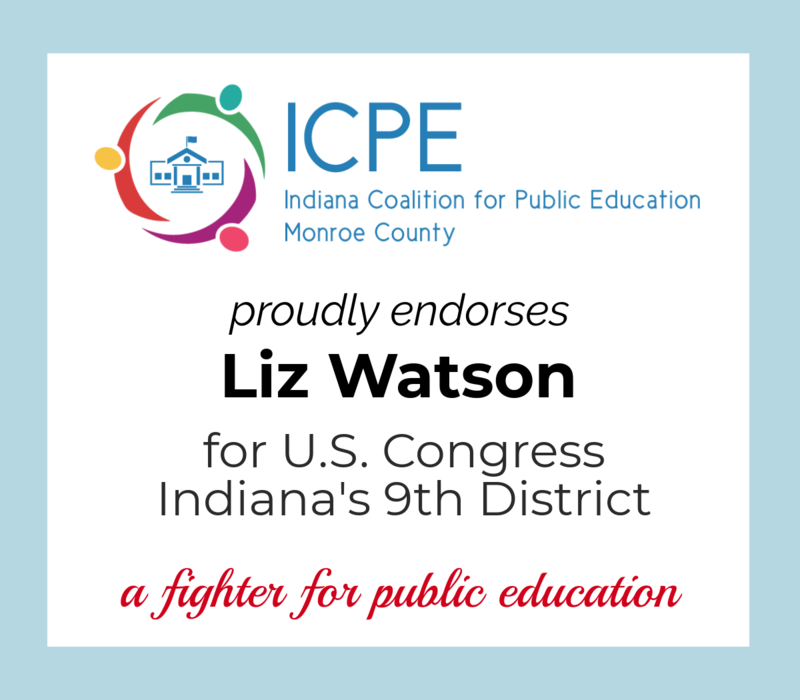 In federal races, the coalition endorsed Liz Watson (U.S. House of Representatives, Ninth District) and Joe Donnelly (U.S. Senate). In examining candidates for state and federal office, coalition members looked at the presence of public education in candidates’ platforms, votes (of incumbents) on key bills that affected public schools, campaign funding sources, and answers to a survey that explored connections to public schools and views about school privatization, high-stakes testing, and the teacher shortage. The endorsed state candidates also participated in a September 12 forum organized by the coalition. 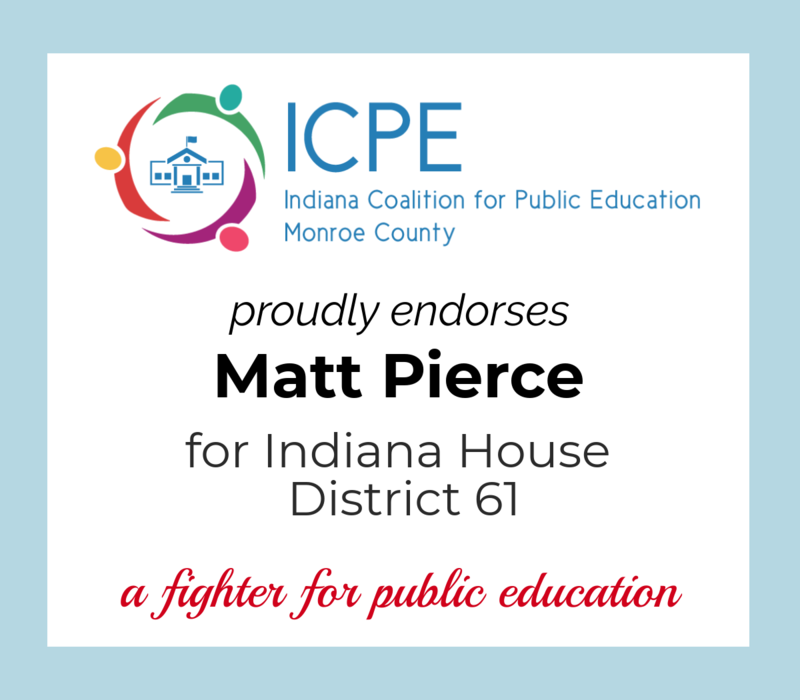 Matt Pierce was the one local incumbent who received the endorsement of the coalition; he also received an A on the legislative scorecard issued by the coalition’s affiliate in Indianapolis. The other incumbents (in House Districts 46, 60, 62, and 65) received Ds on that scorecard based on their votes to make the state superintendent appointed rather than elected, to deprive Muncie and Gary residents of the power to elect an actual school board, to shift taxpayer dollars toward private voucher schools, and to fund public schools at levels well below the rate of inflation. No Republican candidates responded to the coalition’s survey or forum invitation. 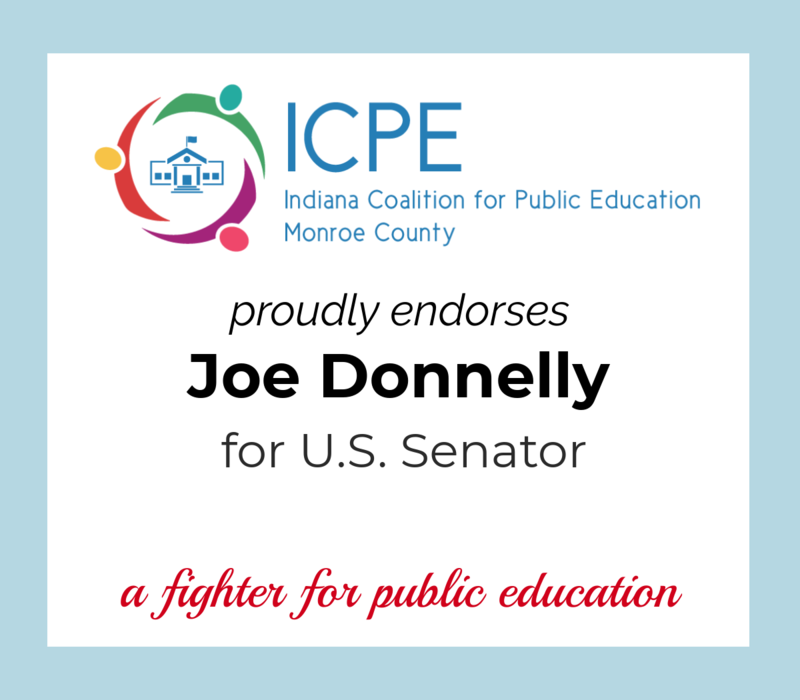 Survey responses and a legislative scorecard based on incumbents’ votes in 2017 and 2018 are available on the ICPE–Monroe County website at http://www.keepeducationpublic.org/2018election. For further information, please contact Cathy Fuentes-Rohwer at 812-320-4400.